Hormones are naturally occurring in animals, humans and plants. They are used by the body to regulate bodily functions and behaviour. In Canada, hormones have been safely used in beef cattle since the 1960s to direct growth toward muscle, rather than fat, which means less feed is needed for an animal to gain weight. This in turn means fewer resources like water, and fuel are needed for an animal to grow. Farmers choose to use hormones in beef cattle because they can safely raise their animals using fewer resources, which in turn decreases their environmental footprint and reduces cost. Hormones are not used on pork or poultry production. In some countries, like the United States of America, growth hormone (somatotropin) is used in dairy cattle to increase milk production. No documented harmful or negative effects have ever been reported in people after consuming meat from animals treated with any hormone or hormone-like substances, when used according to the product label. 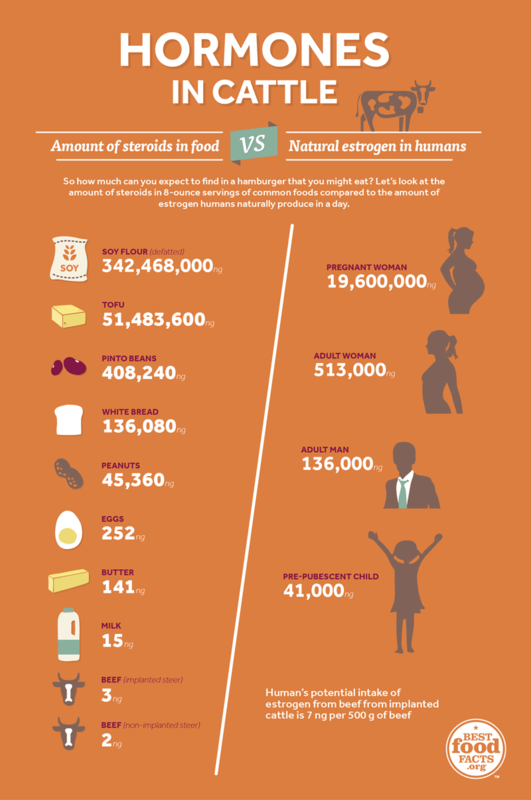 So…how much hormone is in the meat that you eat?